Haldane makes the reader feel as if they’ve has been dropped into the daily lives of those living in 1869-era Victoria, and refuses to shy away from the truth in favor of a more politically correct approach to historical fiction. At times things get ugly and grimy…. But there is much hope teeming throughout The Devil’s Making, and so I hope that Haldane…. is just getting started on his career as a novelist. A novel that succeeds on multiple levels — among them psychological, sociological, racial and romantic — “The Devil’s Making” is no easy, quick or light read. Earthy and erudite, an admirable blend of history and mystery, it examines issues the human race continues to confront while simultaneously spinning an absorbing story. Haldane never shies away from period-specific language and attitudes, which make readers feel as though they are walking the dirty streets of Victoria by his side. Historical whodunit fans will relish this exciting trip to 19th-century frontier Canada. Haldane’s first mystery, evocative and elegantly written, is a deeply philosophical look at a relatively unknown historical period. 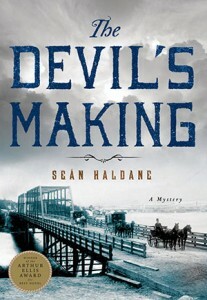 The Devil’s Making combines Canadian history, solid crime plotting and a real sense of native-Canadian social history into a stunning tale of greed, deceit and murder…. Beautifully plotted and written, this is a terrific debut that promises greater works to come.